China has reportedly been trying to jam U.S. Air Force RQ-4 Global Hawk flights flying over the increasingly volatile South China Sea. Meanwhile, they are busy perfecting their own High Altitude Long Endurance (HALE) unmanned aircraft, with new pictures of a twin fuselage design emerging on the internet. The Global Hawk works on both UHF line-of-sight and UHF and Ku band satellite data-links to communicate with its ground control station that can be half way around the world. Because of the aircraft’s great autonomy, with crews using a desktop-like point and click interface, jamming is not as catastrophic as it could be for some man-in-the-loop flown unmanned aircraft. Much of the Global Hawk’s mission can actually be flown without commands from its control element at all if need be and the aircraft can be programmed to return home, or loiter for a period of time before returning home, if command and control communication is lost. Attempting to interfere with unmanned aircraft remote commands and communication is one thing, but GPS jamming is another issue as any aircraft can be effected. Still, U.S. military aircraft have some systems that hedge against this, including sensitive inertial navigation systems that have software to detect position discrepancies within their embedded GPS units and discount the erroneous readings as programmed. As potential enemies capabilities evolve, such as jamming and spoofing GPS signals, better filtering logic has been applied to counteract these measures although some systems remain more susceptible to slight changes in GPS coordinates over time than others. 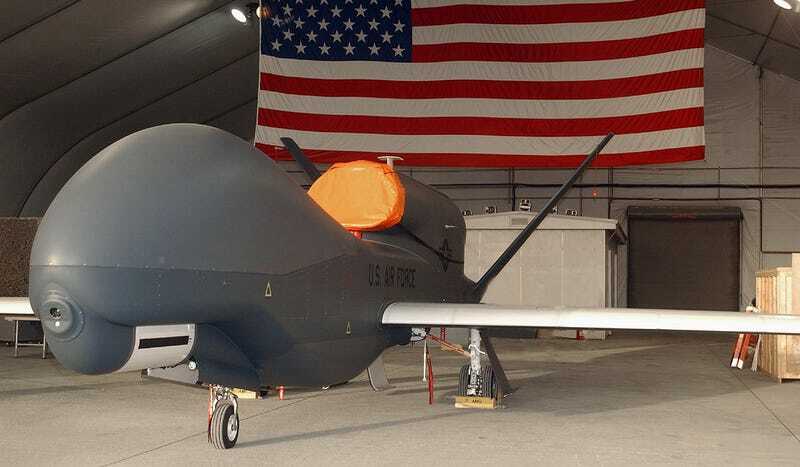 The attempted jamming of Air Force Global Hawks flying high over China’s island building project in the South China Sea is just one more escalation in what has become a chilly, although very predictable time in American-Chinese relations. The U.S. recently sailed a Carrier Strike Group through the region, and China has begun warning American surveillance and maritime patrol aircraft to exit an arbitrary air identification zone near their growing man-made islands empire. The Chinese Navy is also very active around these islands and just because they do not have surface-to-air missiles or fighters deployed to them yet, a nearby Chinese Navy surface combatant likely does. All this has led US officials to finally talk openly and bluntly about China’s extra-territorial claims. This has created a new era of saber rattling in the region, and it will undoubtedly push smaller regional powers to align more closely with the U.S. or China. These moves will only increase tensions further without some serious diplomatic efforts put in place to douse both sides military blustering. It seems as if China has already began militarizing their new islands, with motorized artillery pieces being present on least one of them. This is only the very start of what will almost certainly become a series of sea fortresses. Expect full on air bases, surface-to-air missile systems, anti-ship missiles systems and even ground attack cruise missiles to show up on these islands as they are further developed. This is why confronting China now on this tumultuous topic makes a lot more sense than when they have already hardened the area with anti-access weaponry. Meanwhile, China continues to work on its own High Altitude Long Endurance unmanned aircraft systems. These systems have been in development for the better part of a decade, with exotic features like the diamond/tandem-wing “Soaring Dragon” being tested in the past. Yet China’s latest and largest design, supposedly built by Shenyang Aircraft Corporation and dubbed the “Divine Eagle,” features massive twin fuselages and a forward canard. This indicates that the aircraft will have more volume for sensors and communications systems than what a single fuselage design could accommodate. The Divine Eagle is rumored to be a multi-role platform, capable of Broad Area Maritime Surveillance (BAMS) in similar role as the Navy’s new MQ-4C Triton, as well as acting as a network node, air-to-air radar platform. Seeing as space is an emerging battlefield in itself, with satellite communications being potentially vulnerable during a near-peer state conflict, a squadron of high-flying Divine Eagles could ‘daisy chain’ communications around a theater and possibly back to the Chinese mainland. This would make degrading China’s long-distance command and control capability and disrupting their decision cycle a more challenging task than blinding their satellites alone, and it is an especially useful capability considering the massive expanses of the Pacific Theater. Above all, a Chinese unmanned aircraft operating in the BAMS role is critical for China as it will work as a long-range enabler to key anti-access systems like the Shadowy DF-21D anti-ship ballistic missile. Over-the-horizon radars can be destroyed in place and have questionable resolution under certain conditions. Yet a high-flying long endurance aircraft packing a powerful radar can make such a ‘carrier killing’ weapon a much greater threat than it is today. You can read all about why this capability is so critical to China’s defense strategy in this piece from a few years ago. As the US continues its attempt to ‘pivot toward the Pacific’ and now that the dirt laundry is on the table so to speak, it will be interesting to see both sides posture for naval supremacy. As for the possibility of a conflict between the two economic giants? It is possible. Those who think that limited conventional conflicts among large powers will never happen because of the chance of tripping a nuclear war or because of the idea of mutually assured economic destruction may very well be proven wrong in the coming decades, although let’s hope they are not.